The fortress of Alamo is just outside of the town of Bexar, on the San Antonio River. The town is about one hundred and forty miles from the coast, and contained, at that time, about twelve hundred inhabitants. Nearly all were Mexicans, though there were a few American families. In the year 1718, the Spanish Government had established a military outpost here; and in the year 1721, a few emigrants from Spain commenced a flourishing settlement at this spot. Its site is beautiful, the air healthy, the soil highly fertile, and the water of crystal purity. The town of Bexar subsequently received the name of San Antonio. 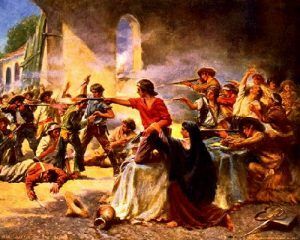 On December 10, 1835, the Texans captured the town and citadel from the Mexicans. These Texan Rangers were rude men, who had but little regard for the refinements or humanities of civilization. When David Crockett with his companions arrived, Colonel James Bowie, of Louisiana, one of the most desperate of Western adventurers, was in the fortress. The celebrated bowie-knife was named after this man. There was but a feeble garrison, and it was threatened with an attack by an overwhelming force of Mexicans under General Antonio López de Santa Anna. Colonel William Travis was in command. He was very glad to receive even so small reinforcement. 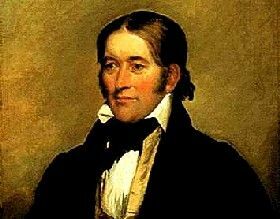 The fame of Colonel David Crockett, as one of the bravest of men, had already reached his ears. According to Crockett’s account, many shameful orgies took place in the little garrison. They were evidently in considerable trepidation, for a large force was gathering against them, and they could not look for any considerable reinforcements from any quarter. Rumors were continually reaching them of the formidable preparations Santa Anna was making to attack the place. Scouts were brining in the news that Santa Anna, President of the Mexican Republic, at the head of sixteen hundred soldiers, and accompanied by several of his ablest generals, was within six miles of Bexar. It was said that he was doing everything in his power to enlist the warlike Comanche in his favor, but that they remained faithful in their friendship to the United States. Early in the month of February, 1836, the army of Santa Anna appeared before the town, with infantry, artillery, and cavalry. With military precision they approached, their banners waving, and their bugle-notes bearing defiance to the feeble little garrison. The Texan invaders, seeing that they would soon be surrounded, abandoned the town to the enemy, and fled to the protection of the citadel. They were but one hundred and fifty in number. Almost without exception they were hardy adventurers, and the most fearless and desperate of men. They had previously stored away in the fortress all the provisions, arms, and ammunition, of which they could avail themselves. Over the battlements they unfurled an immense flag of thirteen stripes, and with a large white star of five points, surrounded by the letters “Texas.” As they raised their flag, they gave three cheers, while with drums and trumpets they hurled back their challenge to the foe. The Mexicans raised over the town a blood-red banner. It was their significant intimation to the garrison that no quarter was be expected. Santa Anna, having advantageously posted his troops, in the afternoon sent a summons to Colonel Travis, demanding an unconditional surrender, threatening, in case of refusal, to put every man to the sword. The only reply Colonel Travis made was to throw a cannon-shot into the town. The Mexicans then opened fire from their batteries, but without doing much harm. In the night, Colonel Travis sent the old pirate on an express to Colonel Fanning, who, with a small military force, was at Goliad, to entreat him to come to his aid. 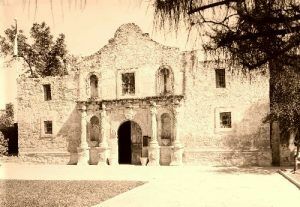 Goliad was about four days’ march from Bexar. The next morning the Mexicans renewed their fire from a battery about three hundred and fifty yards from the fort. A three-ounce ball struck the juggler on the breast, inflicting a painful but not a dangerous wound. Day after day this storm of war continued. The walls of the citadel were strong, and the bombardment inflicted but little injury. The sharpshooters within the fortress struck down many of the assailants at great distances. “The bee-hunter,” wrote Crockett, “is about the quickest on the trigger, and the best rifle-shot we have in the fort. I have already seen him bring down eleven of the enemy, and at such a distance that we all thought that it would be a waste of ammunition to attempt it.” Provisions were beginning to become scarce, and the citadel was so surrounded that it was impossible for the garrison to cut its way through the lines and escape. In the course of a week the Mexicans lost three hundred men. But, still reinforcements were continually arriving, so that their numbers were on the rapid increase. The garrison no longer cherished any hope of receiving aid from abroad.